We only allow our kids to eat chips once in awhile. Chips time for them is a very rare occasion (only during movie watching and Dvd maraton night at home). Now that a new healthy chips is out in the market, I'm more comfortable serving Julia, Rafael and Juan Soyami Soya Chips, knowing that this product is healthy . 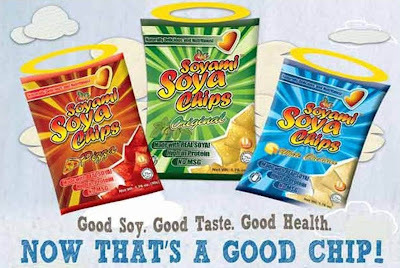 Soyami Soya Chips are now available in Original, Pizza and White Cheddar variants at all leading supermarkets like Robinsons, Hi Top, Landmark, SM Snack Exchange, and selected Puregold.